Card of the Day ~Forgiveness Heals~ You were drawn to this card as a reminder that anger, when stored in the mind and body, is harmful to your health or even lethal. Although something from your past may seem unforgivable, it’s time to purge yourself of these toxic emotions...for your own sake. 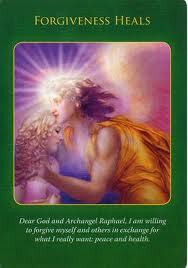 Forgiveness doesn’t mean: “I’m okay with what you did.” Rather, it simply indicates: “I’m no longer willing to suffer from angry thoughts and feelings.” Archangel Raphael is standing by, ready to restore your mind and body to a peaceful state through the process of forgiveness. All you have to do is ask for his guidance and be willing to forgive. Raphael will help you with the rest. Always remember there are also people out there that can aid you in healing psychologically, physically, emotionally and spiritually. You are never alone and there is always help available...you just have to ask. You are very much loved and God wants the very best for you. Have a fantastic day. I love you all!